We previously reported that the speed cameras used in Baltimore County do not meet a requirement under state law that they be certified by an "independent Calibration Laboratory", but were instead only certified by the manufacturer, who has an obvious vested interest in declaring the cameras to be flawless. We sent a letter of inquiry to Baltimore County Police, who were either unwilling or unable to answer most of those questions. Our Inquiry letter, sent on March 12 (several days prior to our previous report on the subject), included 10 questions pertaining to the Mesa Engineering built G1-ATR cameras used by the county. On March 21 the county sent a response to that letter which failed to answer most of the questions. "1) What is the legal basis for considering a speed monitoring system's manufacturer to be an "independent calibration laboratory"? Does Baltimore County have any legal opinion or other document supporting this? 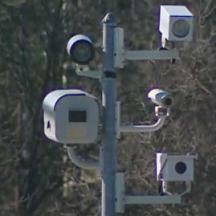 And was this considered when selecting a vendor and/or certification lab for Baltimore County's speed camera program?" The county, rather than simply answering the question, responded by citing a provision of the Maryland Public Information act permitting requests for documents containing legal advice to be: "SG 10-611(g) defines a Public Record for the purposes of the act. It does not require the custodian or a government official to provide a response to questions or provide an explanation. SG 10-618(b) allows the custodian to deny inspection of any Intra- Inter Agency memorandum that would not be available by law to a private party in litigation. Legal Opinions are covered by this section." We noticed that the county did NOT say that they have no such documents, such as a letter of advice from the county attorney or attorney general. Of course if they did have such an opinion, and it supported the position that considering the "manufacturer" to be an "independent" calibration lab (even though they have a financial interest in being able to sell the device) why would they not simply have presented it, or at least answered the question in some way, in order to end the controversy? "2) If it is Baltimore County's position that it is acceptable for the manufacturer to be considered an "independent calibration laboratory", then what is the objective proof, provided by an entity without a financial incentive to declare the device reliable, that a speed monitoring system is accurate, reliable, and appropriate for law enforcement purposes under all real world conditions? Can you explain how this satisfies the legislative intent of the above portion of state law?" to which they used similar legalistic language to say they were refusing to answer the question: "SG 10-611(g) defines a Public Record for the purposes of the act. It does not require the custodian or a government official to provide a response to questions or provide an explanation. " We asked several other basic questions regarding the accuracy and testing of the devices. "3) What are Mesa Engineering's credentials for manufacturing and testing speed monitoring systems? Can you provide documents showing this? 4) The certificates list an "Internal Calibration Test" which states that "The transmitter frequency of this speed Measuring Device has been tested and found to be within the prescribed limits of 34.5 GHz - 34.7GHz". It does not seem to say anything about actual speed measurements performed on real vehicles. Can you provide the actual test procedures for this annual calibration test? What is the basis for asserting that the testing performed is sufficient to show that the devices are accurate and reliable when the device is operating unattended under all possible real world conditions? 5) Is this device on the IACP's list of conforming law enforcement products? Can you provide documentation showing whether this device has been evaluated by an organization such as the IACP for unattended use? Was this part of the selection criteria for this device?" "8) Is this device FCC certified? Can you provide documents showing this? 9) How was Mesa Engineering compensated for the device and the certification? How much are/were they paid (by the county or by ACS)?" For each of those questions, the county responded by stating : "There are no documents on file at BCoPD for this request". OK, so they have no documents showing either a) the credentials for the company who built and certified the device b) whether there is any basis for concluding that the testing Mesa did perform on the devices is sufficient that the devices are accurate and reliable, c) whether the most authoritative organization for law enforcement products has ever examined or approved the device d) whether the device was approved by the FCC for use in the US, e) what financial interest Mesa has in finding the devices to be accurate & reliable. Yet the evidence produced by these devices is simply being presumed to always be correct and to be a valid basis for issuing tickets and finding people guilty in court. "6) How does this device distinguish between multiple vehicles in adjacent lanes or close to each other? Was target identification part of the testing for this device? 7) How long after the speed measurement is taken are photos taken by this device, and what is the time between frames? Are these times fixed or variable? If it is variable then is it possible for citation reviewers and ticket recipients to see the actual time intervals, and if so to what precision? 10) Can you please provide a complete technical specification, operating manual, and citation review procedures for the G1-ATR?" by providing a copy of a speed camera citation (which might have shown the time interval if they had been readable) and a one page document which appears to be part of a tutorial for approving citations, that apparently shows that citations MUST be rejected if there are multiple vehicles present. (ie the answer to question 6 is that the device CANNOT distinguish between multiple vehicles, and any citation which contains multiple vehicles issued by this type of camera SHOULD be thrown out.) No "technical specification" or "operating manual" was provided. The same type of Mesa Engineering G1-ATR camera is one of two types of cameras used by Baltimore City's program, which is independent from Baltimore County's program but uses the same Contractor (ACS State and Local Solutions, a Xerox corporation). Baltimore City's program is several times larger than Baltimore County's program , however we have not yet obtained copies of Baltimore City's speed camera annual calibration certificates (but the fact that the same contractor provided the cameras makes it likely the same situation applies with their G1-ATRs). Data previously released by Baltimore County shows that the county had issued over 43,000 citations as of November 30 from 15 camera sites, all of which are G1-ATR cameras. Baltimore City's much larger program issued 379,237 citations in its first year, but it is unknown how many of those were issued by G1-ATR cameras and how many of those were issued by the more commonly used "Gatso" cameras (which apparently have received some independent testing), which Baltimore City also uses. The ironic thing is that the requirements of state law are in fact extremely weak, not specifying a specific standard they must be tested against, only that an independent lab must do the testing. Yet Baltimore county and its contractor cannot meet even this weak standard. We suggest that any citizens who have an issue with Baltimore County's failure to comply with state law, or with being subjected to enforcement by cameras with cut-rate accuracy testing, should raise the issue with the Baltimore County Council, and with their representatives in the state legislature.